Back in February, via a Google Books search, I found an article about my maternal great grandfather in the 1909 volume of Gleanings in Bee Culture. A New Kink in Moving Bees. We have been moving bees considerably this season, and have learned several new kinks. 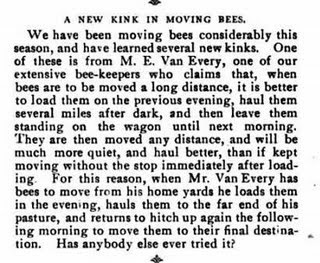 One of these is from M. E. Van Every, one of our extensive bee-keepers who claims that, when bees are to be moved a long distance, it is better to load them on the previous evening, haul them several miles after dark, and then leave them. standing on the wagon until next morning. They are then moved any distance, and will be much more quiet, and haul better than if kept moving without the stop immediately after loading. For this reason, when Mr. Van Every has been moving from his home yards he loads them in the evening, hauls them to the far end of his pasture, and returns to hitch up again the following morning to move them to their final destination. Has anybody else ever tried it? The article dated my great grandfather's apiary business at least as far back as 1909. I conducted another search on my great grandfather's name this week to find any new information, and found another entry in the 1908 volume of the magazine. [The volume is recorded as having been scanned by Google at the same time, and should have shown up in the February search. I'm not sure why it didn't.] Apparently my great grandfather wrote a letter to the editor of the magazine, and in it he provided a detailed history of his apiary career up to that point. 'Detailed' may be an understatement. 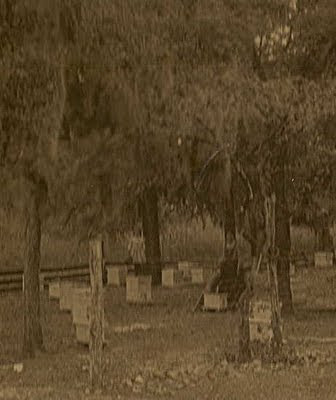 In 1903 we started with 11 colonies in Dovetailed hives. We increased to 27, and our surplus was 136 lbs per colony. In 1904 we increased to 62, and surplus was 127 lbs. per colony. In 1905 we started in the spring with 51 colonies, having lost 11 during the winter. We increased to 135, and our surplus was 66 2/3 lbs. per colony. In 1906 we increased to 252, and our surplus was 62 lbs. per colony. 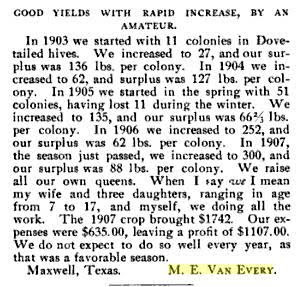 In 1907, the season just passed, we increased to 300, and our surplus was 88 lbs. per colony. We raise all our own queens. When I say we I mean my wife and three daughters, ranging in age from 7 to 17, and myself, we doing all the work. The 1907 crop brought $1742. Our expenses were $635.00, leaving a profit of $1107.00. We do not expect to do so well every year, as that was a favorable season. Maxwell, Texas. M.E. Van Every. He also indicates in the letter that in 1908 his entire staff was himself, his wife, and three daughters. Those three daughters would be my grandmother, Myrtle, age 7, her sister Evva, age 15, and her sister Willa, age 17. It is Melvin's oldest daughter Minnie, who isn't included in the count - she married in 1905, and it's possible she helped out the first couple years. My great uncle, Samuel Van Every, had also moved off the farm by 1908. So it is likely my grandmother and great grandmother in this photo, which I have posted before, and I suspect is the Van Every Apiary. George Geder remarked a week ago that Genealogy is more than just dates, and how far back you can go, it's about being able to tell the stories of your ancestors' lives. I couldn't agree more. Thank you for the idea of Amanuensis Monday. I've posted a wedding announcement for one set of my paternal great grandparents. It was a real pleasure and an eye-opener to take the time to carefully read the article to post it.